New technologies and the use of digital media are undeniably changing the postural and behavioural patterns of users. However, there is still little data on the scientific characterization of these new postural habits. Recently, Essilor International’s R&D teams have developed a specific experimental setup that has delivered original results. Through the analysis of postural data measured in this context, they were able to establish a specification for the design of a new class of ophthalmic lenses. During the last decade, we have seen an explosion in smartphones, tablets, e-readers and other hybrid devices that concentrate the functions of a computer in a portable device. In France, smartphone purchases increased by 7% in one year, reaching 46% in 2014. Three out of ten people state that they are equipped with a touch tablet, a statistic that nearly doubled in one year, from 17% in 2013 to 29% in 2014 . Moreover, most users do not seem particularly attached to a single device, but move easily from one device to another (using a tablet at home, a smartphone while commuting, a computer at work and so on) (Fig. 1). All these devices represent a great step forward, since they dramatically increase possibilities for exchange, interaction and cooperation, and facilitate access to knowledge. The information dispensed by these devices is much the same, in content, as that of traditional books, but is presented in a very different form. While books require a linear reading mode punctuated by pages, electronic text can be navigated freely by the reader, using hyperlinks; moreover, the ability to scroll text on the screen, using a keyboard or touch screens, eliminates the notion of page. Electronic reading requires the reader to interact with his or her device. Furthermore, the vast majority of these devices are “mobile” or “handheld” devices and can be used in a wide range of everyday situations: while standing in public transport, sitting on a sofa, or lying in a bed. These new habits are revolutionizing the way we interact with traditional media and we can expect our postures to differ from those we adopt with paper media. Since ophthalmic lenses are traditionally designed to respond to the constraints of paper media, it is critically important to take an interest in these new behaviours. With this in mind, we undertook a study in 2013 to collect data on posture during the use of these new devices. Before starting our experimentation, we reviewed the literature on the postural data of users while viewing various types of screens. In a study on visual fatigue, Jaschinski (2002)  asked forty subjects to position themselves at a comfortable distance from their computer and then measured the eye-screen distance for each of them. He obtained a mean distance of 63 cm (standard deviation 13 cm, CI95%[38; 88]). The act of lowering one’s eyes when viewing a computer screen has been the subject of numerous studies in recent years and has led to sometimes contradictory ergonomic recommendations. Indeed, a group of researchers believe that a downward viewing angle of 40° is more suitable than an angle of 15° (Ankrum, 1997) , because the former would be preferred for intensive tasks (Ankrum et al., 1995) . It also seems that a significant lowering of the eyes reduces the risk of dry eye by decreasing the exposed ocular surface (Jainta & Jaschinski, 2002) . However, numerous studies have sought to test the relevance of a lowered screen. An angle of view of 40° below the horizontal causes one to incline the head more sharply, resulting in increased muscle activity in the neck, shoulders and back than an angle of 15° (Turville et al., 1998; Straker & Mekhora, 2000) [10, 11]. Furthermore, it seems that operators prefer a screen positioned so that the axis of gaze is horizontal or slightly inclined (Bauer & Wittig, 1998) . In the current state of research, the preferred viewing angle can be considered to fall within a range of 8-16° (Seghers, Jochem & Spaepen, 2003) . For a review of the literature on this topic, see Cail & Aptel (2006) . Given the uncertainty of ergonomic recommendations, we decided to conduct an internal campaign to measure eye declination (i.e. lowering of the eyes), intended to serve as the basis for the development of our range of occupational lenses. 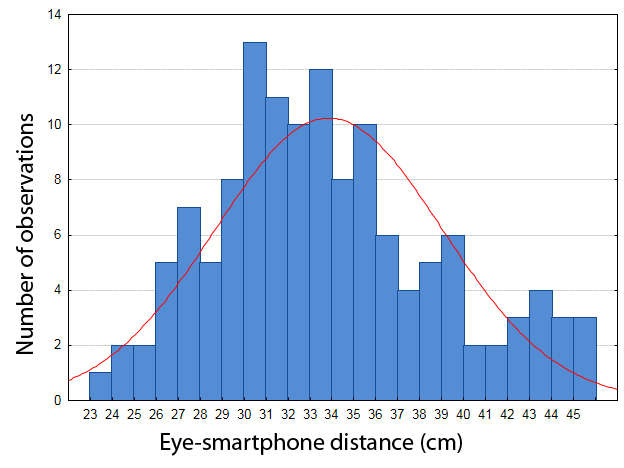 Our measurements show an eye declination of 4° (SD 1.53°) during computer use. We noted a wide variability between individuals in their way of positioning themselves relative to a computer screen, and we therefore recommend that this parameter be taken into account when developing occupational lens designs. It is very difficult to find postural data in the literature on television screen viewing postures. We know, however, that the average size of LCD television screens sold worldwide in 2013 is between 36 and 37 inches measured diagonally . For this size screen, the recommended distance from the screen is about 1.90 m (between 1.40 and 2.40 m). Since the television set may be placed flat on the floor, on a low cabinet, a dresser or wall-mounted, it is not easy to find data on viewing angles. We nonetheless recommend a zero-degree gaze angle for our occupational lenses inasmuch as the television set is most often located at eye level. Through a review of the literature in this area, we determined that there is a real lack of postural data related to the use of recent digital devices, whence the need to undertake a measurement campaign. Before starting the measurement campaign, we reviewed a number of opinion surveys on the use of digital technologies for the purpose of defining the age group of our population, selecting the devices to be tested and to ensure that we cover as completely as possible the conditions under which these devices are likely to be used in everyday life. 2.2.1 Who accesses the Internet? If we look at the age of people accessing the Internet, according to the results of the Ipsos Tech Tracker study in the third quarter of 2013,  we can see that all age groups are represented and, even though the percentage of Internet users is lower in the over-65 age group (55.5% on average), this percentage remains very high in the other categories (> 80%) (Fig. 2). Moreover, we can easily assume that the percentage of people over 65 years accessing the Internet will increase in coming years, in view of the fact that digital technologies are playing an increasingly important role in our everyday lives. So we did not set an age limit for the recruitment of our subjects. Regarding electronic devices, according to the same study, in 2013, the percentage of laptop owners in the household remained stagnant at about 63%, and the number of connected TVs stood at 14%. It is noteworthy that the number of latest-generation consoles fell slightly, from 40% to 37% in one year, presumably in favour of smartphones, which grew strongly, moving up from 37% to 55%. Similarly, there was a sharp rise in the number of tablets (11 to 30% in one year) and e-book readers (12 to 17% in one year) (Fig. 3). We chose to focus on the latter three devices in our study. Fig. 3: Progression of digital equipment. Source: Adapted from Tech Tracker quarterly release Q3 2013 IPSOS Media CT (data on 1,000 adults in the United Kingdom over 15 years of age). In 2012, according to the Ipsos Tech Tracker  study, tablets were used for relatively traditional activities, which have not changed substantially to date. These activities include: consulting emails and social networking, looking up information, watching videos, reading newspapers, playing video games, checking the weather forecast, etc. (Fig. 4). These are nearly the same activities practiced on mobile phones. We selected seven of the most representative activities for our study. Fig. 4: Main activities on tablets. Source: Tech Tracker quarterly release Q3 2012 IPSOS Media CT (data on 98 adult tablet owners and 909 adults not owning tablets in the United Kingdom over 15 years of age). According to the same study, in 2012, the three main locations in which tablets are used are: the living room (92%), the bedroom (65%) and the kitchen (47%) (Fig. 5). We can assume that in the living room, people tend to be sitting, in the bedroom they are probably lying down, and in the kitchen, they are usually standing. The same assumptions can be made for smartphones. We therefore decided to focus on these three positions (standing, seated and lying down). Fig. 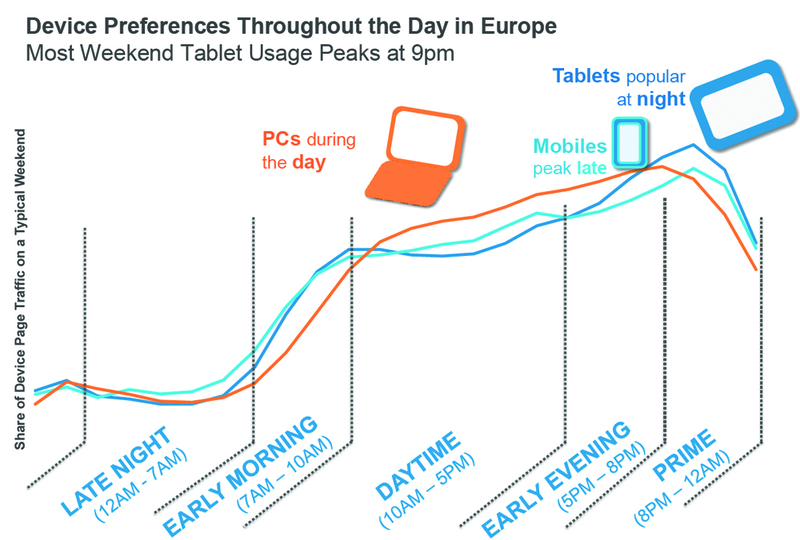 5: Main locations of tablet use. Source: Tech Tracker quarterly release Q3 2012 IPSOS Media CT (data on 98 adult tablet owners in the United Kingdom over 15 years of age). Twenty-two subjects participated in the study. The average age was 36.2 (with a range of 22 to 51). Since the goal was to collect reference data, only three subjects with presbyopia were included in the study, since it has been shown that progressive lenses influence natural posture (Mateo B, Porcar-Seder R, Solaz JS & Dürsteler JC., 2010) . The subjects all wore their usual prescription lenses and were all familiar with the digital device being tested (questionnaire). In order to record data on the posture of people in movement, Essilor acquired a technical platform called MoViS (Motion and Vision Science) equipped with a motion capture system (VICON©) comprising eight synchronized infrared cameras that can capture the coordinates (X, Y, Z) of retro-reflective markers in real time (Fig. 6). Each subject was first fitted with a headset equipped with four markers, and we placed four other markers on the upper part of his or her body to mark the position of the trunk (Fig 7). Before starting the experiment, we took a series of photographs of the subject’s head, which were used to calculate the position of the axis of rotation of each eye  in the headset’s reference point. Then, to be able to measure head and eye movements, we needed a reference position looking straight ahead. For this, the subject had to stand about 2 m in front of a mirror and look at the root of his or her nose in the mirror (Fig. 8). Once the subject was in this position, we proceeded with the acquisition of the markers’ coordinates. The three devices used by the subjects were also equipped with markers. As a result, during the course of the experiment, we were able to calculate the exact position, in real time, of the subject’s head, and the centers of rotation of their eyes and trunk, as well as the exact position of the object being manipulated. For each of the fourteen activities, we processed the data on the positions of the axis of rotation of the eyes, the device and the trunk so as to extract such data as: eye-screen distance, eye declination, rotation of the head relative to the trunk and rolling of the head. During the experiment, the data acquisition frequency of the VICON© system was set at 100 Hz. For each subject, we measured the mean and standard deviation data (eye-screen distance, eye declination, rotation of the head relative to the trunk and rolling of the head) over the duration of the activity. The standard deviation provided information on the subject’s stability during the activity. We then processed the data via analysis of variance (repeated measures ANOVA). And to delve further, we conducted planned comparisons to identify differences between groups: comparisons by device (smartphone, tablet, e-book reader) or by position (standing, sitting, lying down). 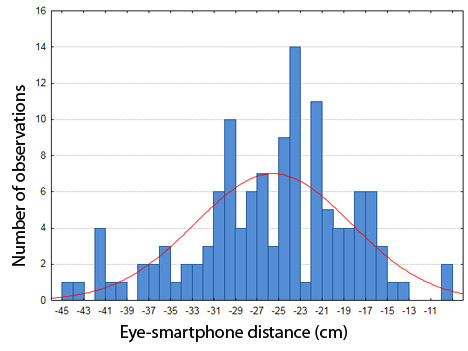 The mean distance from the screen was 33.8 cm for the smartphone (SD 5.1 cm) (Fig. 9); 38 cm for the e-book reader (SD 6.5 cm) and 39.7 cm for the tablet (SD 6 cm). Analysis of variance shows that there are significant differences between activities (F(14.294)=11.662 and p<0.05). Planned comparison analysis showed a significant difference (t(21)=7.358; MSE= 0.727; P=3.06E-7 < 0.05; d=1.56 ; CI95%[3.9; 6.8]) between small screens (4 inches for the smartphone) versus large screens (6 inches and 9.7 inches respectively for the e-book reader and the tablet). The smaller the screen, the closer the distance of use. These results were subsequently confirmed by Maniwa et al. (2013) . Ko et al. (2012)  show that users reduce their viewing distance when the font size is smaller. But the font size of our devices was also related to their size: 1.5 mm for the smartphone, 2 mm for the e-book reader and 3 mm for the tablet. Our results were thus consistent with their work. Fig. 9b: Dispersion of eye-Smartphone distance measurements for 22 subjects and 6 activities. By comparison, a study conducted internally on forty subjects shows that the mean distance for reading on paper is 41.8 cm (SD 9.6 cm) and for writing on paper is 41.8 cm (SD 11.4 cm) or approximately 8 cm more than for smartphone use. The mean eye declination angle was 25.6° for the smartphone (SD 7.2°) (Fig. 10); 20.2° for the e-book reader (SD 7.2°) and 20.3° for the tablet (SD 7.7°). Analysis of variance shows that there are significant differences between activities (F(14.280)=15.641 and p<0.05). Planned comparison analysis showed a significant difference (t(20)=5.872; MSE= 0.920; P=4.96E-7 < 0.05; d=1.58 ; CI95%[4.9; 8.5]) between standing and seated positions. But since the device most frequently used standing is the smartphone, we also found a significant difference between the smartphone and the two other devices (t(20)=6.942; MSE= 0.773; P=9.67E-7 < 0.05; d=1.51; CI95%[3.8; 6.9]). Fig. 10b: Dispersion of eye-Smartphone distance measurements for 22 subjects and 6 activities. By comparison, a study conducted internally on forty subjects showed that the mean eye declination angle for reading on paper is 18.7° (SD 6.1°) and for writing on paper is 13.8° (SD 8.8°). Eye declination in the use of recent digital devices is thus much more pronounced than is the case during use of paper media. We measured the angle in a horizontal plane between the head and the trunk. Analysis of variance shows that there are no significant differences between activities: F(14.266)=1.7223 and p=0.051. The mean angle between the head and the trunk is -0.3° (SD 5°) where a negative angle indicates head rotation to the left. Since the mean angle is very small, we can conclude that when using digital devices, the head remains perpendicular to the trunk (Fig. 11). Fig. 11: Angle of rotation of the head relative to the trunk. We also measured the roll angle of the head. Analysis of variance shows that there are significant differences between activities: F(14.238)=2.4875 and p=0.026 < 0.05. However, planned comparison analysis shows no difference between devices or positions. The mean roll angle for all activities combined is -2.9° (SD 3.6°) where a negative angle indicates head rotation to the left. 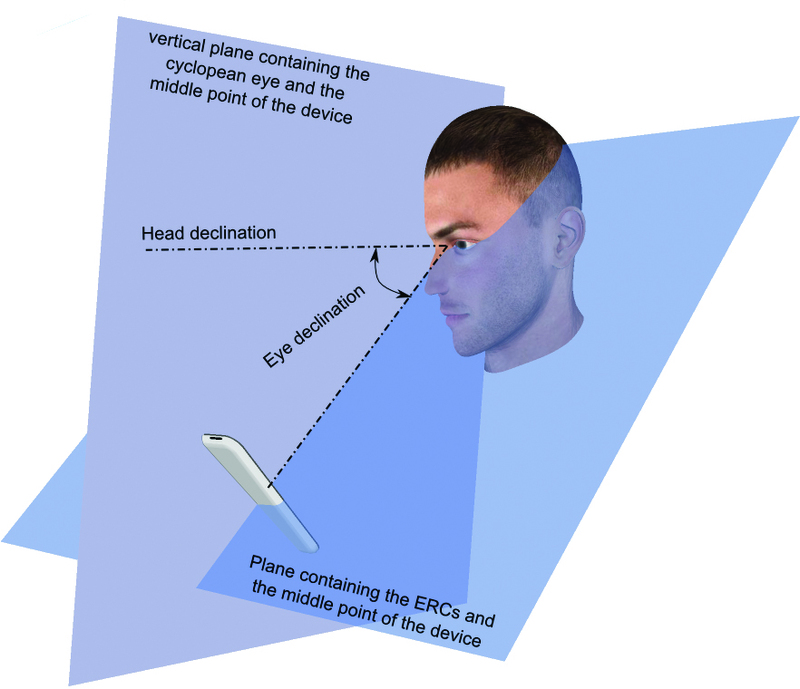 Since the mean angle is very small, we can conclude that when using digital devices, the head remains vertical. Since the data acquisition frequency of the VICON© system is set at 100 Hz, a datum is received every 10 ms. The standard deviation of each datum gives us an idea of the subject’s stability. The mean standard deviations for the 22 subjects and 14 activities is 0.8 cm for the eye-screen distance; 2.6° for the eye declination angle; 1.2° for head rotation relative to the trunk and 1.4° for the roll angle of the head. All these values are very low, indicating that, when interacting with digital devices, the subjects have a highly static, somewhat rigid posture. Our review of the literature showed a highly significant variability between individuals in how they positioned themselves relative to their computer screen. Moreover, our results confirmed a modification of our postural behaviours relative to such traditional media as paper. We found that, when handling recent digital devices, our posture is very stable, or even rigid. The head remains vertical and perpendicular to the trunk. We also showed that, when using such devices as the smartphone, tablet and e-book reader, the eyes are lowered more sharply and the viewing distance is closer than is the case for paper. These parameters must be taken into account in the development of occupational lenses to offer the wearer optimal visual and postural comfort. • Postural data (eye-screen distance, eye declination angle, head rotation and roll angle) were measured and analyzed in Essilor’s R&D centres. • The results show that subjects maintain a highly static, even rigid posture when interacting with digital devices. • On a smartphone or tablet, the eye-screen distance is shorter and the gaze is lowered more sharply than is the case with paper media. • A precise understanding of these new requirements has paved the way for the design of a new class of ophthalmic lenses at Essilor. 05. Mateo B., Porcar-Seder R., Solaz J.S., Dürsteler J.C. (2010). “Experimental procedure for measuring and comparing head-neck-trunk posture and movements caused by different progressive addition lens designs.” Ergonomics; 53(7):904-13. 07. Ankrum D. (1997). “Integrating neck posture and Vision at VDT workstations”. Proceedings of the 5th international scientific conference: work with Displays Unit, 63-64. Tokyo, Japan, November. 08. Ankrum D., Hansen E., Nemeth K. (1995). “The vertical horopter and the angle of view”. In A. Grieco, G. Molteni, B. Piccoli & E. Occhipinti (Eds), Work with Display Units 94(pp. 131-136). Amsterdam, North-Holland: Elsevier. 09. Jainta S., Jaschinski W. (2002). “Fixation disparity: Binocular vergence accuracy for a visual display at different positions relative to the eyes”. Human Factors, 44, pp443-450. 10. Turville K, Psihogios, J., Ulmer, T., Mirka G. (1998). “The effects of video display terminal height on the operador: a comparison of the 15° and 40° recommendations”. Applied Ergonomics, 29, pp239-246.